Invitations finished in gold will match your wedding style perfectly! 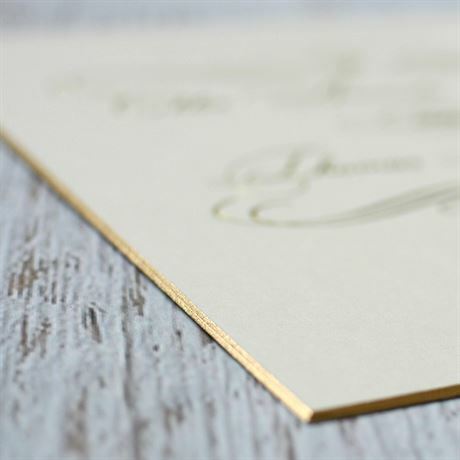 Recipients will admire the sleek beveled edge printed in shimmering gold foil on these heavyweight wedding invitations featuring a matching gold flourish frame. Your wording is stamped in gold foil to complete the luxurious look. Personalization Options: Beveled edge is printed in gold. Flourish design and your wording are printed in gold foil. First off, I just wanted to say that Invitations by Dawn is one of the best companies I have ever worked with. Their customer service is amazing, responsive and they truly care about making their customers happy. I would always ask for Jonah, Margie and Ida, whenever I called the customer service line. Those three are HUGE assets to the company and I am thankful for all of their help. As for the invitation, it is very high quality, elegant and beautiful. It is very thick and not flimsy at all. I went to two invitation stores in Manhattan, but they just didn't have what I was looking for exactly. As soon as I saw this invitation online, I ordered the sample. When the sample arrived by mail, I knew it was the one. When I opened the box and saw my invitation I was beyond happy! I made the decision to purchase these invitations because other invites of this quality were requiring a 6-7 week lead time which I did not have as I waited until the last minute to order my invites. The quality of these invites was amazing and beyond my expectations. What I liked most was the thick paper which provided a luxury feel to the invitations. Combined with the gold lining on the outside of the invite along with the gold font, this invite came out so beautifully. I was honestly shocked when I received them because I had only viewed the invite on the internet and I thought the pricing was too good to be true. It turned out to be better quality than many comparable options I was looking at, a great deal for possibly the best quality invitation. Everything else from the response cards, inserts and envelopes was also perfect. My recommendations would be to use the suggested fonts on the invites/inserts, it came out very nicely. I would also recommend the pearl liner in the inner envelopes and the pearl envelope for the response card. Some people do without inner/outer envelopes, but I would recommend using both to preserve the invite in the mail. The outer envelope was a bit thin, but combined with the inner envelope it provided for a nice presentation. Don't look anymore, just order this one!